Is there even such a thing anymore? The answer seems to be no, at least not in the traditional sense. There are YouTube sensations and American Idol winners, but they’re more like karaoke performers with choreography. Beyond that, the up and comers who sell out arenas and bring out the crowds seem to be DJs. DJs! I don’t even know how to spell it right: Is it deejay or DJ? I’ll go with the latter since it’s fewer keystrokes. I have no right to judge, but the world I grew up in had certain immutable laws, one of which was that rock and roll would always be king. No one challenged this monolithic truth besides a small number of Anita Bryant types in Seventies news clips. The only time you ever pondered the genre’s mortality was during the quiet part of The Who’s “Long Live Rock,” when Daltrey intones “rock is dead” three times slowly. Of course, that lyric was just meant as a warning to remind you of what could happen if you let them take your rock away. It was an affirmation. And the affirmation that trickled down to teenage America was that even though you’re just a minor, you could contribute your own dollars, along with your heart and soul, to help keep rock and roll alive by purchasing albums, merch, concert tickets and new stereo speakers. The century progressed and new generations of teenagers came of age. Trends rose and fell, but rock and roll was still the mother ship to which they all returned. Oh sure, DJs were already on the scene, but few took them seriously as rivals to actual rock stars. They worked the occasional dance club, but their natural purview was bar mitzvahs and wedding parties, not headlining arenas and stadiums. When the notion of rock star-level DJs did eventually surface in public media, there was no reason not to believe that soon enough the kids’ enthusiasm for the fad would quickly max out and they would drop it like a moldy potato. That’s what happened with hair-rock and every other fanciful trend that took rock and roll too far away from its roots. The youth culture would quickly and aggressively self-correct this trend, it always did. These DJs would get bounced to the curb with the spandexed hair-rockers soon enough. But in the 2000s, a strange thing happened. The correction never came. Instead, the digital realm began to completely displace rock and roll’s analogue roots. Analogue, in fact, became obsolete. Tapes, records, even CDs were rendered superfluous. Musical instruments themselves became unnecessary. In theory, with the swipe of a finger, one kid with one Ipad could mash and tweak every note ever recorded in the history of man to create masterpieces that Beethoven and the Beatles could only dream of. In theory. We all know that there’s more to making music than generating a sequence of sound waves. And we all know that actual musical ability isn’t always at the top of the list of what makes an actual rock star. There are reasons we love the Beatles and Hendrix while remaining indifferent to the multitude of dedicated note-for-note Beatles and Hendrix cover artists. To understand the rock and roll phenomenon a little better, we need to go back to Year Zero, where it all began. Who was the first rock star, anyway? The harder question is why? Was it Elvis’ ability to channel race music to a white audience? Was it the opportunity he had to work with the hit-makers of the Sun Records crew? Was it the pompadour and the pelvis? Most people would agree that it was some sort of combination of all three. But in doing so, they omit the most crucial ingredient of all. There is no Elvis without television, not the Elvis we know, which begs the question, how much of rock and roll itself is the result of television? Is it any coincidence that the era of rock stars more or less matches up with the era of TV? A milestone was reached with the first-ever televised presidential debate, between Richard Nixon and John Kennedy in 1960. If you listened to the debate on the radio, you likely thought Nixon beat Kennedy. If you watched the debate on television, you probably thought Kennedy was the winner. Guess who ended up taking that first election in the live television era? The power of television is that strong. The Nixon-Kennedy debate occurred halfway between two other major television events: the first Elvis appearance on the Ed Sullivan Show and the first Beatles appearance on that program. Would there have been Elvis as we know him without television? 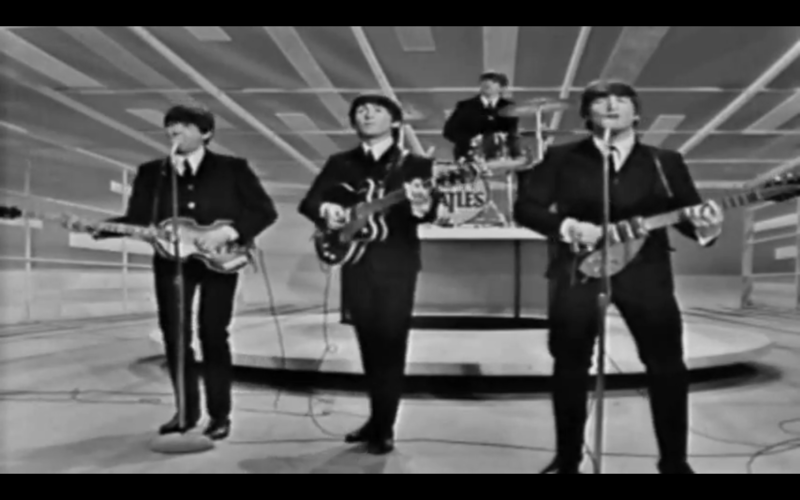 Would the Beatles have had their mania without television? People like to credit the ascent of rock and roll to some sort of collective generational awakening, as if the fingers of teenage America all magically walked themselves over to the sweet spot on the Ouija board together at the same time. But what if the answer was far more mundane? What if rock and roll initially became the coolest thing ever because it was on television Sunday night at 8:00? The Beatles perform on the Ed Sullivan Show, 1964. Movies enabled performers to be seen on multiple screens across all across the nation. Radio allowed them to be heard live in people’s living rooms simultaneously all across the country. But television marked the first time entertainers could be seen live in your living room nationwide and simultaneously. Rock and roll as we know it begins with this visual being viewed by hundreds of millions of eyeballs in their living rooms at the same time. It’s ironic that an aural experience like music would depend on a visual medium like television to gain traction, but maybe that tells us something about the essence of rock and roll, or lack thereof. Elvis already had four gold records by the time he got on Sullivan. People knew what he sounded like, and they liked (or hated) it. What was different about a live appearance was the chance to get a look at Elvis himselvis, and just as importantly if not more so, to get a look at the audience. Check out all those screaming teens. In a way, THAT was the sound that reverberated most strongly with us, not the performances of Elvis or the Beatles. Listen to that sound. It was like nothing ever before heard in the annals of Western Civilization. Teenage girls were succumbing to their hormones while the adults in the room pretended not to notice. But in hindsight it seems obvious that they sensed a loss of control over this marketed-to, largest generation in American history. 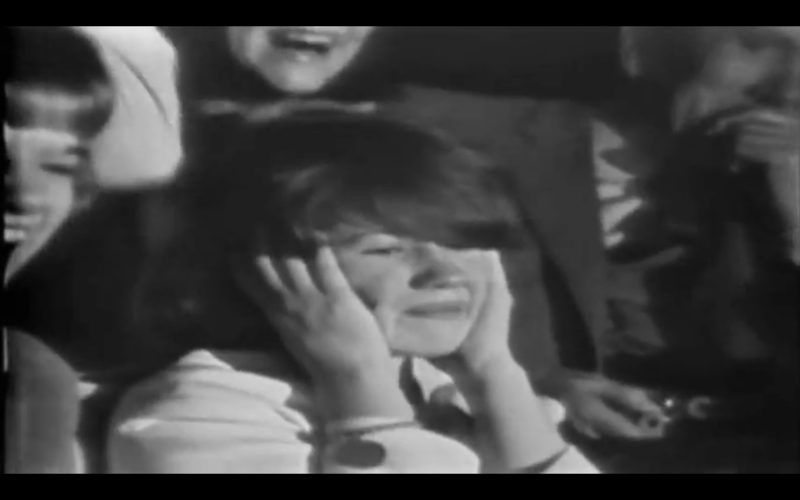 Beatles fan overcome with emotion. Throughout the pre-Woodstock era, the shifting norms of American society played out in the triangulation between Ed Sullivan, his audience, and the performers on the show. It was a Sunday night ritual. Sullivan, the stiffest possible authority figure left of Nixon, introduces the act and then stands back while the kids go crazy. Sullivan then returns to the stage after the performance to comment on the audience’s behavior and to banter with the talent. Sullivan rarely gets what all the hubbub is about, but he’s powerless to stop it. You could see the generation gap itself acted out in those little vignettes. Little did they know at the time just how thoroughly these nascent Baby-Boomers would overturn the status quo in America or how soon. 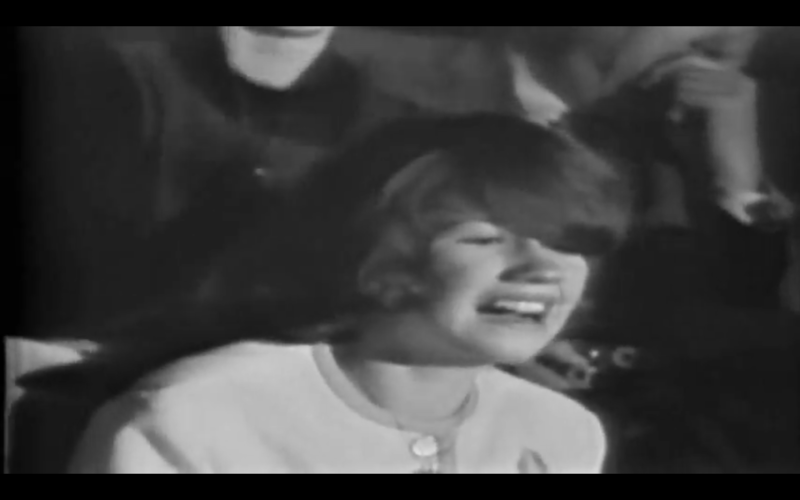 Excited young American during “I Want To Hold Your Hand,” from the Beatles’ debut performance on Ed Sullivan in 1964. What would she be up to in 1968? This should be an article in a magazine. D.J. Deejay. If you’re not jockeying discs, then what are you? An MP3 jockey? Thanks, kerbey. Magazines…didn’t they used to sell those in stores a long time ago, like records? This is one of my least popular blog posts, so maybe it would indeed be better off in another context..
BTW, for a little while in my 20s I was a radio DJ on an AM station, and we played carts (ie 8 tracks) as did most stations at the time. We were cart-pushers. But what about pop rock? Justin Bieber, Katie Perry, New Direction? I’m not sure who New Direction is, but chart-toppers like Katie Perry and Justin Bieber, who are the ‘rock stars’ of today, are basically karaoke acts. There are two basic ideas at work in this essay. One is that what we consider to be “rock stars” are basically video stars, in which case Perry and Bieber are just the latest examples in a long line going back to Elvis. The other is that rock and roll itself as a popular genre peaked years ago. As you say, Bieber, Perry, and New Direction are POP. It’s doubtful whether these sorts of magazine-cover mainstream stars will be “rock” anymore, the way they would have been in previous decades. If you think about who the best, most popular rock stars are in 2013, it’ll still be people whose careers started in the 60s or 70s. In the upcoming third part of this essay, I posit that Kurt Cobain was the last new international caliber rock star. Kid Rock might be an exception, but I don’t know his stuff well enough. It seems like he’s hybridized rap and rock, as well as marketed himself to the country audience (which still has bona fide stars), which would make him a ‘post-rock star’.